which, as mentioned briefly in Chapter 2, is often referred to as Glen's flow law, as it was first suggested by John Glen (1955) on the basis of his early uniaxial compression experiments on ice. As noted, the exponent, n, depends on the creep mechanism operating. A substantial body of experimental data on laboratory ice and on natural glacier ice supports adopting a value of 3 for this exponent (Hooke, 1981), and this seems to be consistent with theoretical expectations (Equation (4.4)). Older experimental data suggesting a lower value at low stresses are often questionable because tests were not continued long enough to be sure that the transient phase of creep (Figure 4.8) was complete. However, recent experiments by Pimienta and Duval (1987) and studies by Alley (1992) and Montagnat and Duval (2000) again raise the possibility of values between 1 and 2 for deformation at low stresses, temperatures, and cumulative strains. As noted, they argue that grain-boundary migration is particularly efficient under these conditions so internal strain energy is small, and the density of dislocations therefore does not increase as rapidly with stress as suggested by Equation (4.3). Healing of dislocations by diffusional processes may also limit the density (Alley, 1992). section, we will explore modifications of Equation (4.5) that incorporate some of these variables. where, as before, Q is the activation energy for creep. Bo is now a reference parameter; literally, it is the viscosity at 0K = to, but this is physically meaningless. Bo is still a function of the other parameters listed above, such as fabric, texture, microstructure, and so forth. o of tests. The data points at lower temperatures fall on a straight line with slope Q/R. However, at temperatures above -10 °C, the points deviate from a straight line in a direction implying a higher activation energy. In other words, the increase in creep rate with temperature is greater than expected. This is because the grain-boundary processes discussed above begin to influence the creep rate. In particular, the decrease in grain boundary interactions with increasing water content probably allows the creep rate to increase faster than is the case at lower temperatures. where k is a "constant" that is typically between 0.1 and 0.25 °C-1, 0n is the temperature in Celsius degrees (hence a negative number), and eo is a reference strain rate. 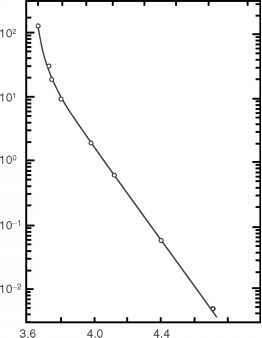 This relation has the benefit of mathematical simplicity, and it is a reasonable approximation in situations in which the temperature varies within a restricted range. However, k varies slowly with temperature and with Q, so the approximation becomes increasingly imperfect as the temperature range increases. where V is the activation volume for self-diffusion, and the quantity (Q + PV) is the activation enthalpy. 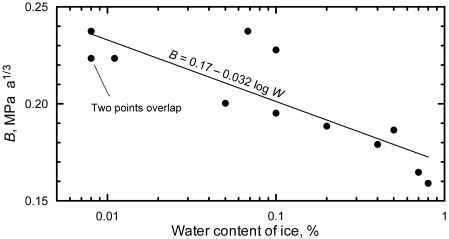 In ice, it turns out that V is very low, and it is not clear whether it is positive or negative. Rigsby (1958) conducted some experiments at constant temperature that suggested a slight increase in creep rate with P, implying a negative V.However, when he varied the temperature in such a way that the difference between the experimental temperature and the melting-point temperature remained constant, the creep rate was essentially independent of pressure. In other words, Vwas0. Later experiments have suggested that it might be slightly positive. In any case, it is small enough to be neglected in most if not all applications. Some experiments have been interpreted as indicating that e increases with increasing grain size (Baker, 1978). As grain size is believed to influence the creep rate in metals, this was not unexpected. However, subsequent experiments failed to find a dependence on grain size (see, for example, Jones and Chew, 1983; Jacka, 1984). It was thus suggested that Baker's samples were too small, and that samples with larger crystals may have been able to creep faster because too much of the strain was occurring in single crystals, favorably oriented for basal glide, that were not buttressed by surrounding crystals with unfavorable o orientations. In later experiments, however, Baker (1981, 1982) used larger samples, deformed in simple shear, and still found a clear dependence of ' on crystal size. It is true that crystal size varies directly with temperature and inversely with strain rate. Crystals in rapidly deforming cold ice may be in the millimeter to submillimeter size range, while those in slowly deforming temperate ice may exceed a decimeter. The key question is whether these variations in size are merely a consequence of the temperature and strain rate, or alternatively whether they actually influence the strain rate. Rigorously, however, Glen's flow law is based on the assumption that the material is isotropic (see Chapter 9). Thus, adding an enhancement factor in this way to accommodate anisotropy is tacit admission of the failure of this assumption. We do not yet have enough understanding of the recrystallization process to write an empirical relationship between E and the factors such as temperature, strain rate, and cumulative strain on which it depends (Hooke and Hudleston, 1980). Therefore, selection of the appropriate values of E to use in any given situation is largely subjective. the latter, while in the expected direction, is probably unreasonable in magnitude. Finally, we return to the effect of the water content on the creep rate. This was studied by Duval (1977) in a pioneering set of sophisticated experiments. His results, expressed in terms of the decrease in B with increasing water content, are shown in Figure 4.18. With an increase in water content from 0.01% to 0.8%, B decreases from ~0.24 to ~0.16 MPa a1/3. Lliboutry (1983) reports that the water content of basal ice of temperate glaciers typically varies between 0.6% and 0.95%. Based on the line in Figure 4.18, this corresponds to a variation in B from 0.177 to 0.170, and hence in s of ~12%. The individual data points in Figure 4.18 suggest an even greater sensitivity. Lower water contents, and hence higher values of B, are likely in temperate ice of polythermal glaciers. At sufficiently high stresses, ice fractures (Figure 4.16). Crevassing, resulting from high tensile stresses, is the type of fracturing with which people are most familiar. However, fracturing near the base of the sub-aerial part of a calving face may be largely a consequence of crushing (compression). materials, and any far-field stresses on the material are amplified at the tips of these cracks. Thus, cracks may propagate at stresses far below the strength of an unflawed specimen of the material. (see, for example, Lawn, 1993, p. 25). Here, r is the distance from the crack tip measured along a line making an angle 0 with the crack axis (Figure 4.19), and K is a parameter known as the stress intensity factor. In general, K = fia^Ja, where a is the crack length. Thus, K increases as either the far-field stress or crack length increase. The fi is a geometrical parameter that, in our case, depends upon factors such as the spacing of crevasses, the ice thickness, and the far field stress. Thus, K\, and particularly fi, describe how the far-field stresses are amplified or intensified around a crack tip. the standard procedure is to express it in terms of a value of K called the fracture toughness, KIc. KIc is a material property of the medium. If KI exceeds Kic, the fracture will propagate unstably. Rist et al. (1999) have summarized their own measurements of KIc on ice cores from Antarctica and other workers' measurements on other types of samples and find that it increases approximately linearly with density (Figure 4.20). 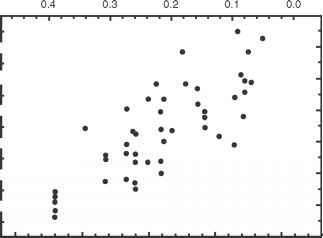 The scatter in the data is large, however. Stress intensity factors are complicated and often tedious to derive, but they can be obtained from handbooks such as Sih (1973). Conveniently, they obey the principal of superposition; thus, in problems with a complex stress configuration, if one can obtain stress intensity factors for each of the stresses separately, they can be added to obtain the stress intensity factor for the whole problem (Kanninen and Popelar, 1985, p. 27). We will illustrate this below. with crevasses, and as most crevasses reach depths of at least 10-20 m, this condition is satisfied. Let us consider the case of a single crevasse in a glacier of infinite horizontal extent subjected to a tensile stress, a. Two stresses are involved: the tensile stress that tends to open the crack and the weight of the overlying ice that tends to squeeze it closed. We need a stress intensity factor for both. For the case of a crack of depth d in a medium of thickness H ^ d subjected to a tensile stress, a, KIt = 1.12a +Jn~d (Kanninen and Popelar, 1985, p. 31). The subscript "t" signifies tension. The hydrostatic stress from the weight of the ice is — p i gz, where p i is the density of ice, g is the acceleration of gravity, and z is the depth below the surface. The negative sign indicates that the stress is compressive. For a crack of depth d with a load varying from 0 at the surface to — pigd at the crack tip, KIo = —0.683pigd\fûd (Kenneally, 2003). Here, the subscript "o" is used for overburden. Vaughan (1993) found that tensile stresses between 0.09 and 0.32 MPa were necessary to open crevasses. (These are considerably lower than the stresses bounding the fracture field in Figure 4.16, probably because glacier ice has more and deeper surface flaws that can develop into crevasses.) For purposes of illustration, let us assume a = 0.2 MPa. KITotal = KIt + KIo then varies with crevasse depth as shown in Figure 4.21. 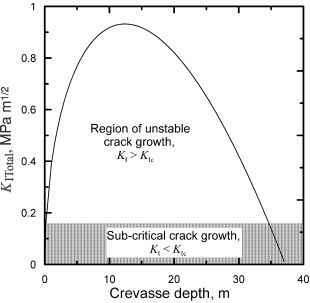 From Figure 4.21, we see that once a crack ~0.16 m long is formed, KITotal exceeds KIc and the crack will propagate unstably to a depth of ~35 m. The depth, of course, depends on a, but this is a realistic depth for crevasses. Of considerable interest in view of the recent collapse of the Larsen B Ice Shelf mentioned in Chapter 3, is the effect of water on crevasse depth. By analogy with the KIo above, the stress intensity factor for stresses induced by water pressure in a crevasse that is filled with water is KIw = 0.683pwgdVW, where pw is the density of water. 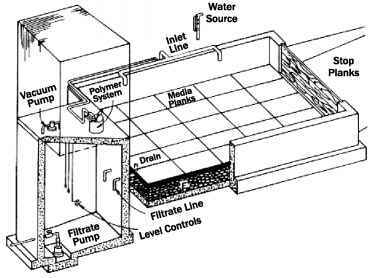 KIw is positive because the water pressure tends to open the crevasse. Because pw > pi, KITotal,which now includes KIw, increases continuously with depth. Thus, once it exceeds KIc, it never drops below KIc again, and the crevasse will penetrate to the bed. Three additional factors that influence crevasse depth are: (1) the presence of low-density firn at the surface, (2) the water level in the crevasse if it is not filled, and (3) the effect of other crevasses. In all three cases, the consequences of taking these factors into consideration are fairly obvious. Low-density firn reduces KIo so crevasses penetrate deeper; if there is not enough water in the crevasse, KIw will not exceed KIo and the crevasse may not penetrate to the bed; and if there is a field of crevasses, the tensile stress will be relieved by adjacent crevasses and no one crevasse will penetrate as deeply as would a single crevasse. Stress intensity factors can be obtained for these three situations (Van der Veen, 1998), but the algebra, while straightforward, becomes considerably more complicated and is beyond the scope of this book.